Drivers voluntarily drove their trucks into the turbulent water in an attempt to block floodwater in Huarong county, Central China's Hunan province, said a flood control official, the news Wechat account Boyangcongpeople reported. Photos of drivers driving trucks to the breach and jumping out have been viral online since Sunday. While some Internet users praised their brave behavior, others questioned the dangerous ways as costly and not scientific. 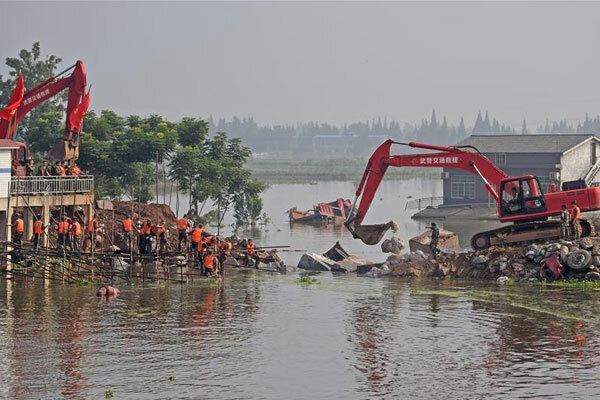 The breach at the Xinhua flood detention basin was plugged Tuesday morning, according to the Hunan province flood control authorities. Zhang Zhihong, director of the flood control office of Huarong county, said experts on the scene made the decision to use heavy-loaded trucks to block the water at that time, without reporting to upper level authorities. "We had no other choice at that time. We hoped there were large cranes, or helicopters, but there were not. The flood was turbulent and the gap was reaching 17-meter wide." A total of 13 trucks full of stone drove to the damaged part of the embankment. "At that moment, we had only one wish – to stop the flood as quickly as possible. 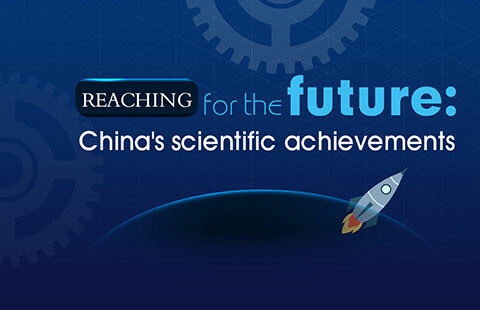 We had no time to think what scientific methods were possible," said Zhang. Zhang said all the truck drivers were ordinary people. When they were stopped by traffic police and asked to join the relief work, nobody said no. "The relief work is to save people's lives. 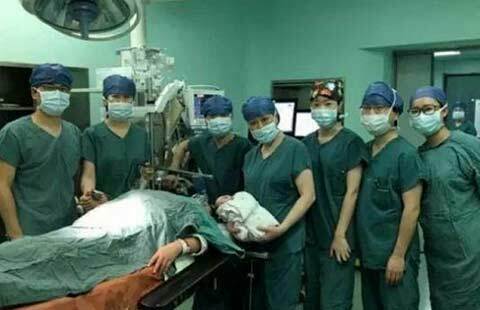 Before rushing into rescue, we communicated well and directed them to jump and abandon ship seconds before the vehicles were engulfed by water," Zhang said. 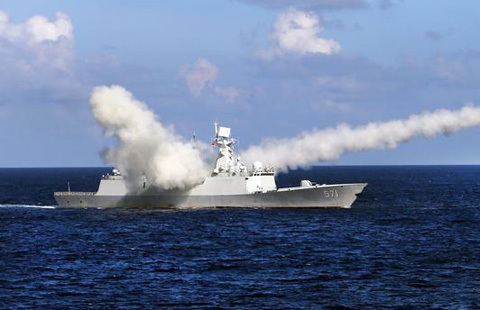 Zhang said that it was not the first time using trucks or boats to block water at breaches. In 1998, boats sunk to the breach at Jiujiang, Jiangxi province, and in 2002, trucks were used to block water in Changsha county, Hunan province. "Five drivers were hurt by bricks and rocks near the breach when they jumped out of trucks, but nothing serious," Zhang said. Liu Kang, one of the 13 drivers, said he almost cried seeing his truck swallowed by the flood, but he did not hesitate nor take evidence for compensation. "I make a living on that truck, which cost more than 200,000 yuan. If I say it didn't make my heart ache, I'd be lying," said Liu. 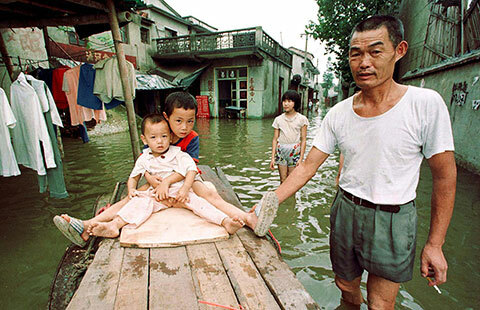 According to China's law on flood control, local authorities have the right to expropriate any materials, including vehicles, to fight against flood, and after the fight, the government will compensate the owners. Chinese internet users have paid much attention to the South China Sea Arbitration in recent days, and argued against the international tribunal ruling made on Tuesday.